Some may call Gamla the “Masada of the north” because the ancient town was held in a seven month seige, and was eventually captured by the Romans during the Great Revolt. The town of Gamla is most famous for its settlement during the Second Temple period, Although Gamla is also mentioned in Talmudic sources as a walled city from the days of Joshua Ben-Nun from the Bible. 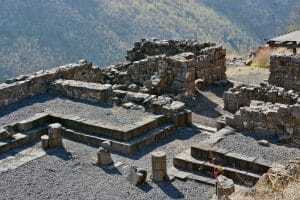 The archaeological artifacts confirm that Gamla was in fact already a fortified settlement in the early Bronze Age, but it was destroyed and only reoccupied in the Hellenistic period. 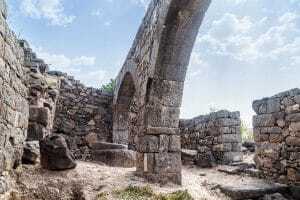 During the time of the Second Temple, Gamla was the capital of the Golan district and its inhabitants mainly supported themselves through agriculture. From the description of Josephus in his writings “Wars of the Jews”, we learn that the town sat atop a very steep hill, surrounded by cliffs, with only a single path, the path that still leads to Gamla today, descending to it from the surrounding hilltops. At this National Park you can connect to nature and experience the historical human story of the site. Hike or drive up the steep trail to get a close up view of the ancient ruins, including the remains of the earliest synagogue in the world. 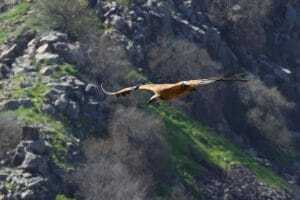 The park is also known for the many vultures constantly hover over the obscure looking hill. 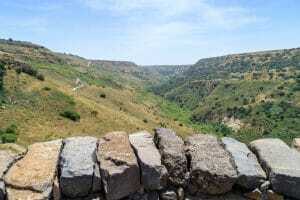 Once you have seen the vultures and antiquities, walk over to get a clearer view of the Gamla waterfall, the highest flowing waterfall in Israel. (reaching the height of 51 meters!). It is Highly reccomended to take a professional tour guide with you to the view the site.